Be the first to share your favorite memory, photo or story of Ralph. This memorial page is dedicated for family, friends and future generations to celebrate the life of their loved one. 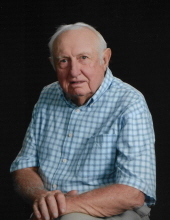 Ralph Herman Passow, age 81, of Perry, Oklahoma passed away March 19, 2019 in Tulsa, Oklahoma. Ralph was born on October 8, 1937, to Irvin Ralph Passow and Edna Margaret Hirschman Passow, southeast of Perry, Oklahoma. He grew up in rural west Noble County and went to White School the 1st through 7th grades and Lone Elm for 8th grade. Ralph then graduated from Perry High School with the class of 1955. He was baptized and confirmed at Christ Lutheran Church. Ralph married Wynona VanBebber on October 31, 1959 at Christ Lutheran Church in Perry, Oklahoma. He started out as a barber then later broke and trained horses. Ralph worked as a Farmer/Rancher southeast of Perry and also did custom hay baling. He raised Angora goats and later camels and other exotic animals. Survivors include his wife, Wynona Passow, of the home, sons Ralph Jr. (Jianmei) Passow and Ben (Kay) Passow, sister Virginia (Gene) Hentges, all of Perry, granddaughter ManYun Ling and great-granddaughter Lillian Ling of Vancouver, Canada. Ralph was preceded in death by his parents, Irvin and Edna Passow. The family would like to visit with friends at Trout Funeral Home of Perry on Thursday, March 21, 2019 from 6:00 p.m. - 8:00 p.m. A celebration of his life will be held at 2:00 p.m. Friday, March 22, 2019 at Christ Lutheran Church with Pastor William Metz officiating. Burial will follow at Grace Hill Cemetery. In lieu of flowers, the family would like memorial contributions made to Christ Lutheran Church, the Gideons or the Perry Wrestling Monument Park, in care of Trout Funeral Home of Perry, 1408 N. 7th St., Perry, OK 73077. To send flowers or a remembrance gift to the family of Ralph Herman Passow, please visit our Tribute Store. The family would like to greet friends from 6:00 p.m. to 8:00 p.m.
"Email Address" would like to share the life celebration of Ralph Herman Passow. Click on the "link" to go to share a favorite memory or leave a condolence message for the family.